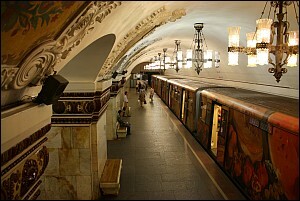 Soviet dictator Joseph Stalin built Moscow's spectacularly beautiful metro as an example to the world, a symbol of "radiant Communist future". Now under strongman Vladimir Putin there are plans to make it the most connected in the world, with free, fast Wi-Fi even in the deepest tunnels. By the end of the year, all lines of the Russian capital's famous subway system – the world's second busiest, with some seven million passengers a day – will be connected to broadband Internet. Opened in the 1930s, the metro was as much a monument to Soviet ambition as a transport system, with extremely deep lines and stations staggeringly decorated with mosaics, frescos, stained glass and heavy chandeliers. Now organisers say its internet connectivity will be equally impressive, letting busy commuters check email and even download the classics of Russian and world literature for free while riding to work.